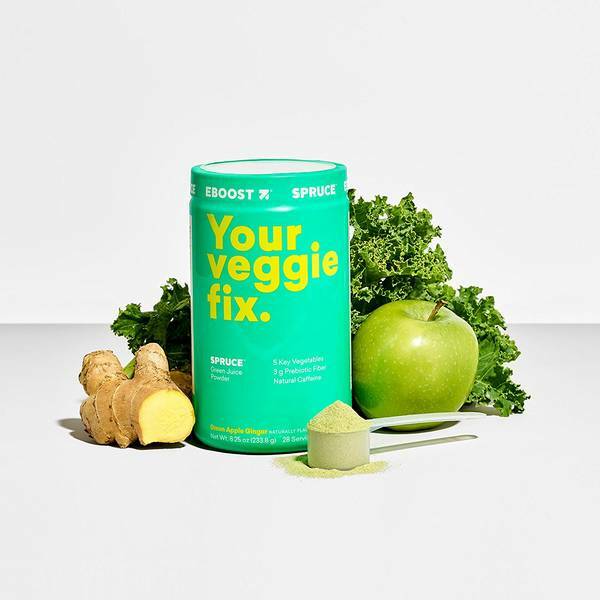 Eboost Green Powder is a kick of whole green vegetables and natural energy. Get all the nutritional goodness of blended juice, without the blender. A kick of whole green vegetables and natural energy. Get all the nutritional goodness of blended juice, without the blender. 1.5 true servings of greens: Each serving of SPRUCE® provides the true whole food equivalent of 1.5 servings of greens as defined by the USDA (TruServ™ Verified, a third party certification). 5 key green vegetables: Made with kale, asparagus, broccoli, spinach, and cabbage, some of the most nutritious greens. 3 g of prebiotic fiber: From organic agave inulin, a dietary fiber that acts as a prebiotic to support intestinal health. Ginger root extract: We use real ginger root extract to enhance the flavor of SPRUCE® and provide additional health benefits. Naturally energizing: Made with Coffeeberry®, a patented ingredient made from 100% coffee fruit, SPRUCE® is rich in antioxidants and delivers 42.5 mg of natural caffeine per each energizing green powder drink. Freeze & air-dried whole greens: We only use freeze-drying and air-drying methods to dehydrate our greens. This process allows us to preserve the nutritional goodness of the veggies in this green juice powder. Only moisture has been removed. Under $1.70/serving compared to $10 for a cold pressed juice! Mix 1 packet/scoop with 6-8 fluid ounces of water. Shake with ice for an extra creamy treat. Take 1 to 2 packets/scoops daily. Pro tip: Add to milk (dairy, almond, coconut) juice (apple or orange), protein shakes, and smoothies. FDA WARNING: The statements made regarding these products have not been evaluated by the Food and Drug Administration. The efficacy of these products has not been confirmed by FDA-approved research. These products are not intended to diagnose, treat, cure or prevent any disease or health condition. Keep this product out of reach of children. In case of accidental overdose, call a doctor or poison control center immediately. All information presented here is not meant as a substitute for or alternative to information from healthcare practitioners. Please consult your healthcare professional about potential interactions or other possible complications before using any product. The Federal Food, Drug, and Cosmetic Act requires this notice.